On election day in the capital, it is raining so hard that no one has bothered to come out to vote. The politicians are growing jittery. Should they reschedule the elections for another day? Around three o’clock, the rain finally stops. Promptly at four, voters rush to the polling stations, as if they had been ordered to appear. But when the ballots are counted, more than 70 percent are blank. The citizens are rebellious. A state of emergency is declared. But are the authorities acting too precipitously? Or even blindly? The word evokes terrible memories of the plague of blindness that hit the city four years before, and of the one woman who kept her sight. Could she be behind the blank ballots? A police superintendent is put on the case. "I have never read a novel that gets so many details of the political behavior that we for some reason insist on calling 'organized' so hilariously and grimly right." 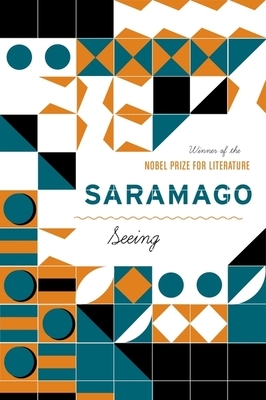 "Saramago's unsettling allegory of power and politics . . . stays with you long after the last page is turned." "We live in age when democracy is being touted as the panacea to the world's ills -- and not just abroad. 'Seeing' suggests a more complicated scenario. It offers that democracy is welcome in our times: that is, so long as it produces the results those in power want." "[A]nother invaluable gift from a matchless writer"
"Saramago’s clear eye for acknowledging things as they are barrages us with valuable insights suggesting that the dynamics of human governance are not as rational as we like to think"
"[A] searching, dry-witted, spot-on political parable ..."
"Saramago has a taste for alternative realities, for the use of fiction as a form of speculation."